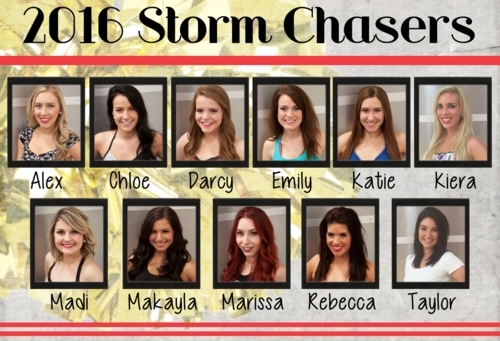 DES MOINES – The Iowa Barnstormers along with Storm Chasers co-captains Emily Toribio and Marissa King are proud to announce the 2016 Storm Chasers Dance Team. Several talented dancers attended the Storm Chasers Dance Team tryout on Sunday, December 13th at the Wellmark YMCA in downtown Des Moines with nine being selected to join the team alongside co-captains Emily and Marissa.The squad includes several familiar faces as six veterans will be returning from previous seasons. Most notably, co-captains Emily and Marissa will be entering their ninth season with the team. In addition to performing live at all 8 Iowa Barnstormers home games, Storm Chasers will appear at numerous community events throughout the year. Single-Game Tickets are on sale for the Iowa Barnstormers 2016 season starting as low as $12 per ticket. Purchase tickets to any of the Barnstormers 8 home games online HERE or by calling (515) 633-2255.